Long before our family roamed through the dusty hills of Wyoming, dinosaurs stomped through this terrain. To learn more about the real Wild West, we put the town of Thermopolis on our Birdy NPS 100 itinerary. 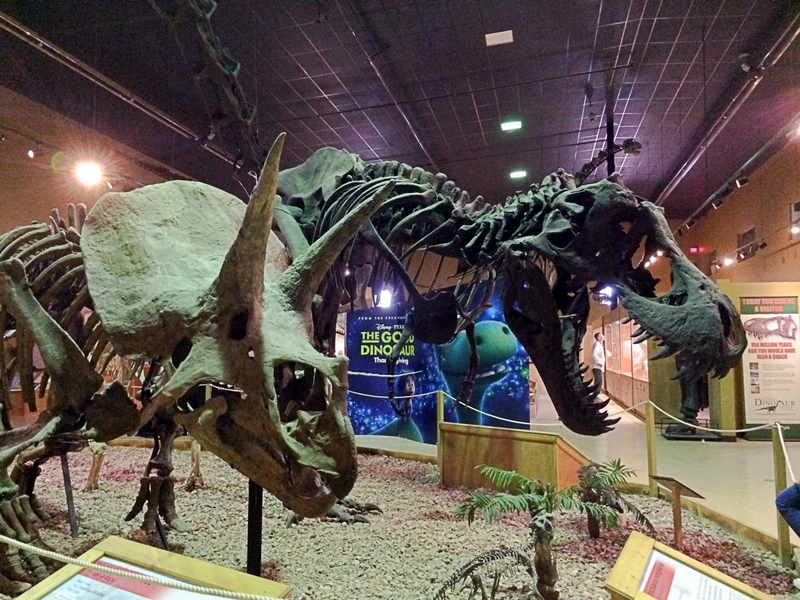 You can learn about the Jurassic past with a visit to the town’s Wyoming Dinosaur Center. This, plus the natural beauty of the area, make it a popular spot for visitors to stop on their way to or from Yellowstone and Grand Tetons National Park. 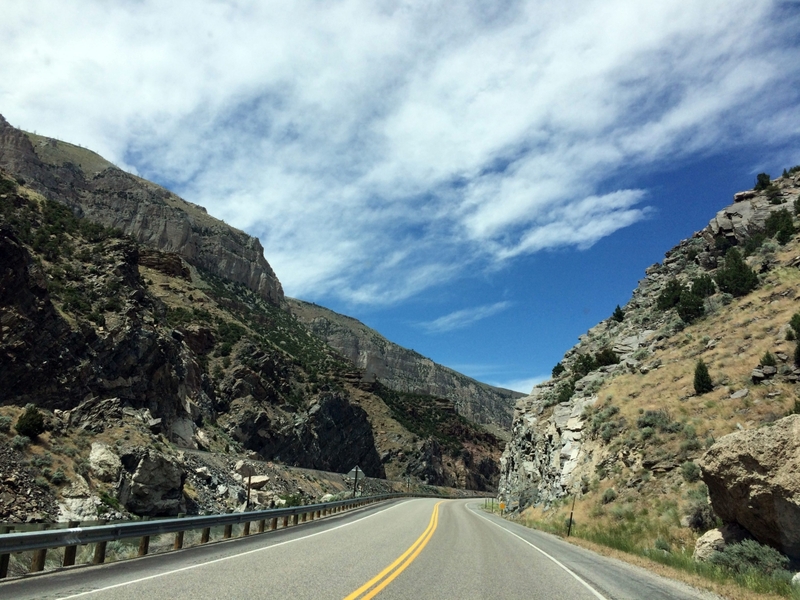 The drive into Thermopolis from Grand Tetons National Park took us through the dramatic landscapes of the Wind River Canyon. A shift in the tectonic plates pushed these craggy hillsides upward eons ago. Nearby, the Wind River winds through the valley below. It is definitely an awe-inspiring drive. 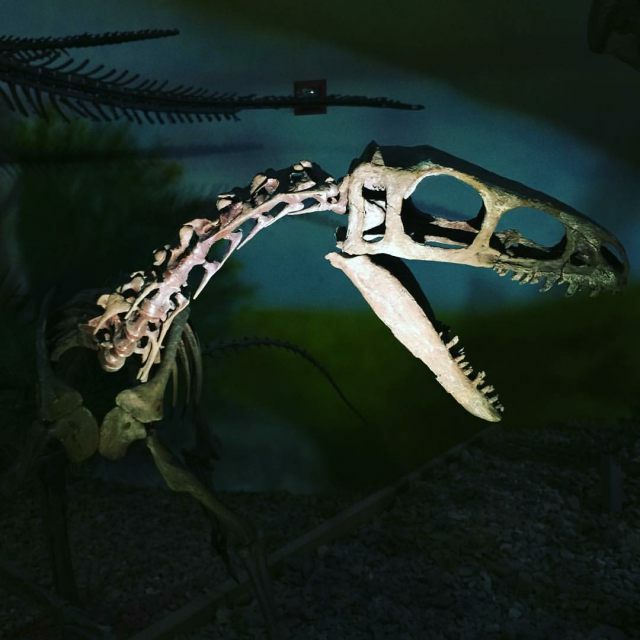 Our younger son had expressed an interest in seeing real dinosaur bones, and when we saw our trip to Yellowstone would put us close to a nationally-recognized dinosaur center, we decided to check it out. 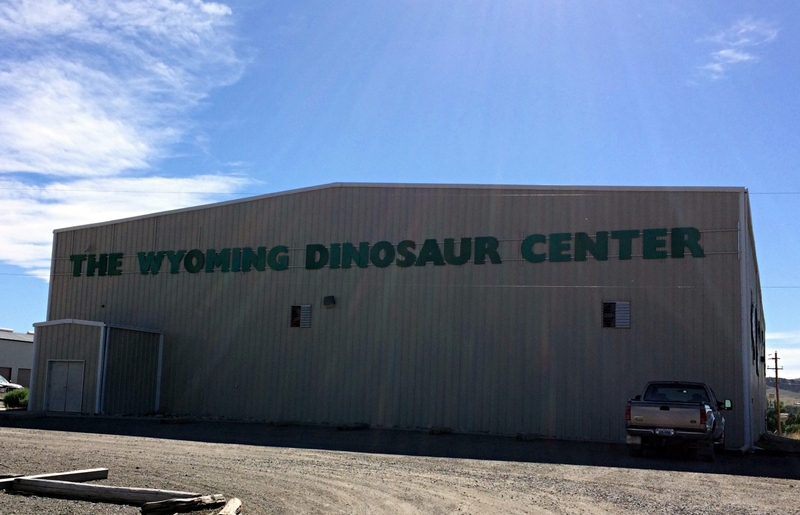 From the parking lot, the Wyoming Dinosaur Center doesn’t look like much. This metal building looks like it could house a small-town roller rink. Luckily, there’s much to be explored inside. Simple displays, accompanied by a treasure trove of artifacts, tell the story of innumerable ancient creatures. This wasn’t the fanciest museum we’ve ever visited; however, everything was nicely arranged in a linear fashion, making it easy to read and learn. In some museums, there’s more of an emphasis on flash than on information, but the Wyoming Dinosaur Center keeps it simple, and we appreciated that as we soaked up as much knowledge as we could. From the tiniest primitive lives to massive dinosaurs, you’ll find it here. Reconstructed dinosaur fossils fill the main area, helping you to appreciate their ginormous size. You’ll see a T-Rex, a Triceratops, and more. Knowledgable staff members roam the floor, eager to offer information. This is not just a museum, it also includes a working lab, where you can take a look at the preservation and preparation process. Visitors can also get hands-on experience by booking a tour to the dig site. Our time schedule didn’t allow for this, but if you have a budding paleontologist in your family, you should check it out. We are glad we had the opportunity to stop by the center and be awed by its infamous residents. 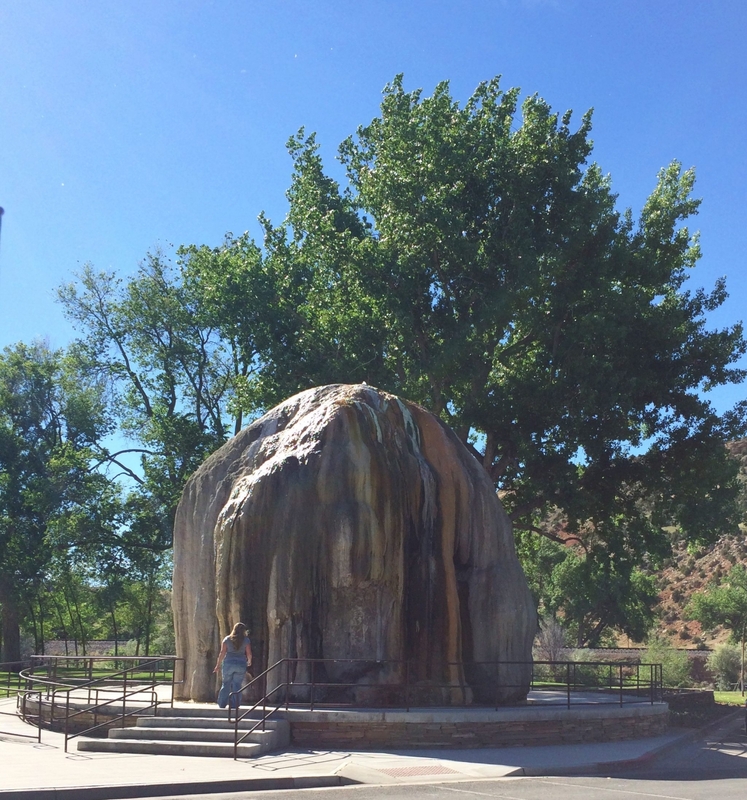 While it was the dinosaurs that brought our family to Thermopolis, the town’s actual claim to fame is its thermal hot springs (hence the name “Thermopolis”). You can explore these at Hot Springs State Park. Much like its national park neighbor, the park is home to a herd of roaming bison, as well as a number of thermal features. After touring the thermal features of Yellowstone, we weren’t quite as impressed with Hot Springs State Park. Plus, these were stinky springs, with the smell of rotten eggs filling the air throughout the park. Despite the smell, people are attracted to natural hot springs for their rumored healing properties. A number of private and public pools are open, allowing you the chance to take a soak. Bring a bathing suit and towel, if you want to partake. The largest hot spring in the park is one of the largest in the world. A large swinging bridge allows you to cross over it and check out the Bighorn River. We did a quick drive through the park, and we probably didn’t do it justice. Apparently, I was also a little worn out of taking photos throughout the rest of our big trip, so this one picture of a giant calcification of mineral rich spring water is the only one I took in the park. 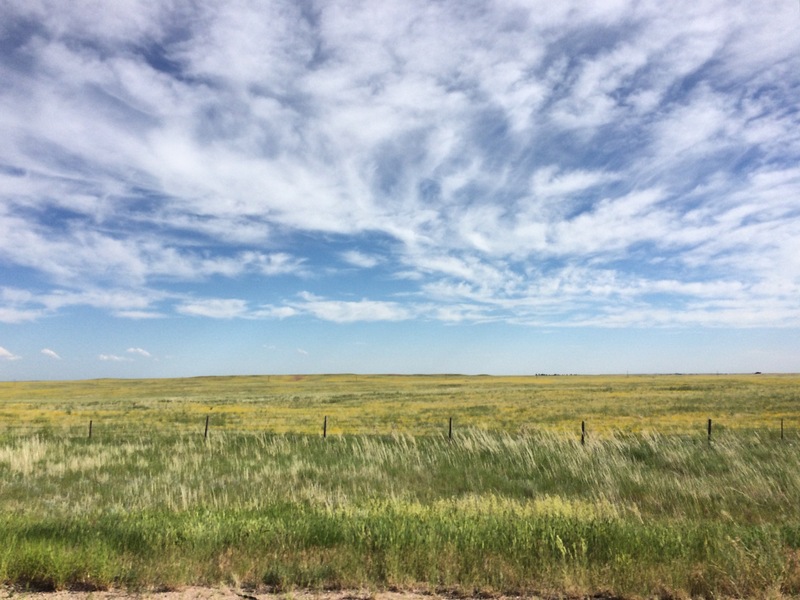 I’m sure if you were on a shorter road trip where Thermopolis wasn’t competing with as many national treasures, it would be a great place to explore. 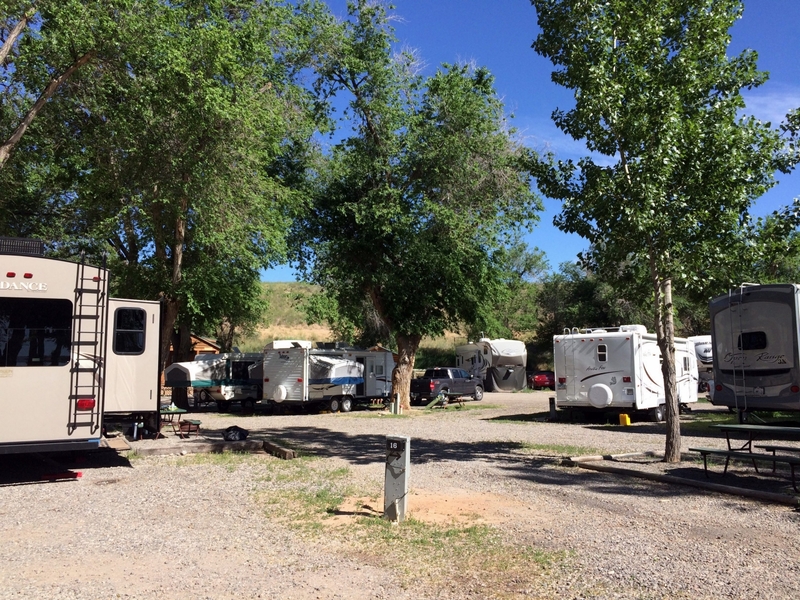 Eagle RV Park is a good, basic RV park if you are looking for a place to stay in Thermopolis. The sites are a little packed in, but we appreciated the amount of trees offering shade in this hot, dusty region. While the park doesn’t offer much much in the way of amenities like a pool, I have to give a shout out to the front desk workers. They were eager to share their recommendations for what to see and do in town. We didn’t get to explore much of Thermopolis since we only stayed one night; however, if we had wanted to do more, the front desk could have provided us a great itinerary. I recognize that this post isn’t like my usual posts, with lots of photos and descriptions. I didn’t quite have as much to say about Thermopolis, but I felt it would be wrong to leave it out entirely, especially since the Wyoming Dinosaur Center was truly a stand out. Overall, if you are interested in dinosaurs or would like to soak in some hot springs, be sure to put Thermopolis on your travel plans. After our night in this little town, we booked it back home, driving 1200 miles in two days. My boys amazed me with their peaceful behavior, allowing us to churn away the miles with little frustration. After making it back to our home state of Missouri, we made one final stop for dinner. Upon returning to the parking lot, we discovered that our car wouldn’t start. We soon realized our car troubles in the Grand Tetons had probably damaged the battery (which explains the strange sulfur smell that seemed to be following us around). Luckily, we were within walking distance to an auto shop. We trekked up the hill, bought a new battery, and hauled the heavy sucker back to Birdy. We had to laugh to keep from crying. 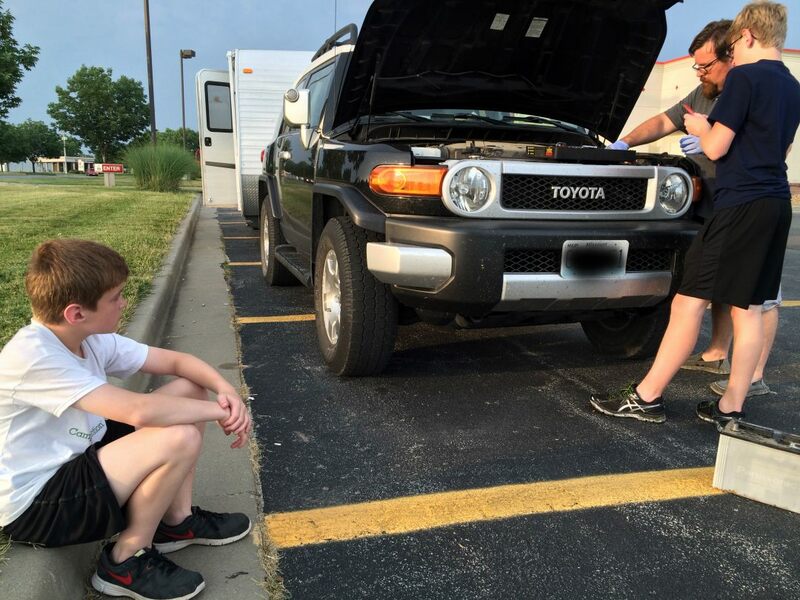 We only made it thirty minutes down the road before encountering another problem: In our frazzled state, we had left my husband’s wallet in the auto parts store. Another hour was added to our already-too-long return trip home as we circled back to retrieve it. And that’s a wrap on Birdy NSP 100, our big summer road trip to celebrate the centennial of the National Parks Service! We spent 22 days on the road and traveled over 4,000 miles on this journey. Along the way, we visited 5 national parks/monuments (Badlands, Mount Rushmore, Yellowstone, Grand Tetons, and Devils Tower), which included the nation’s first national monument and first national park, as well as some charming towns and beautiful state parks. It truly was a great American road trip, chock full of iconic locations. I’m glad we were able to see more grand westward landscapes, some truly unusual sights, and some spectacular mountains. As the first director of the National Parks System (Stephen Mather) said of our parks, “A visit inspires love of country; begets contentment; engenders pride of possession; contains the antidote for national restlessness…. He is a better citizen with a keener appreciation of the privilege of living here who has toured the national parks.” Along our journey, our family experienced each of these. As the sun set behind us, we made our way home. Posted in: Places We've Explored. Tags: BirdyNPS100, Mishaps, Museums, Nebraska, State parks, Wyoming. Sounds like a fantastic trip! With those kinds of mishaps, I’ve been pleased to see our family problem solving together, despite the hardship. 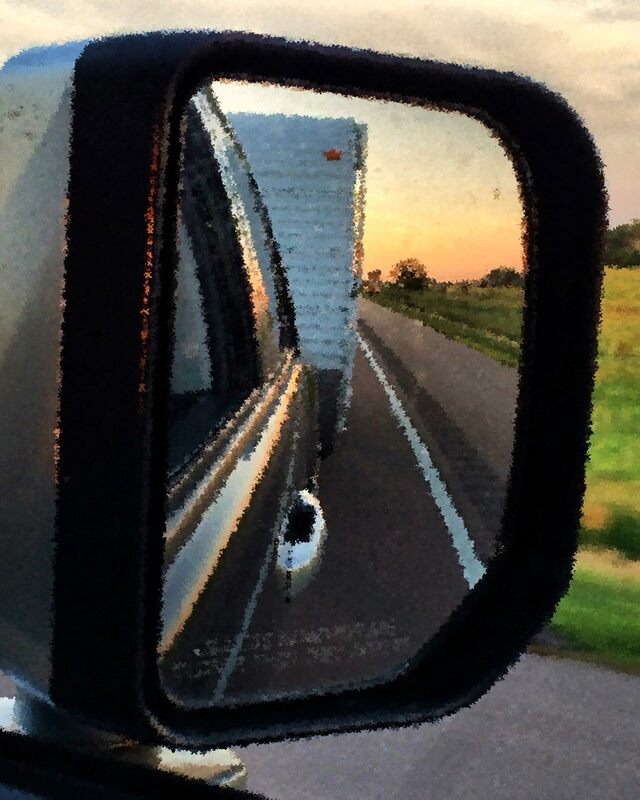 We love seeing America with these road trips. In 2018, we will finally get to head east. I’ll have to add this to our list of possible things to explore on our return visit to the West! Thanks for the great tips! Thanks for stopping by! Hope the tips will be useful.